Very fine, yet very strong with soldered links! Drapes beautifully. Perfect for necklaces, stringing larger hole beads, or making delicate, free flowing fringe and tassels. Although this is very fine chain, a standard 21 to 22 gauge size jump ring fits into the end loop easily so you can attach clasps and/or connect chain as desired to accommodate your design needs. 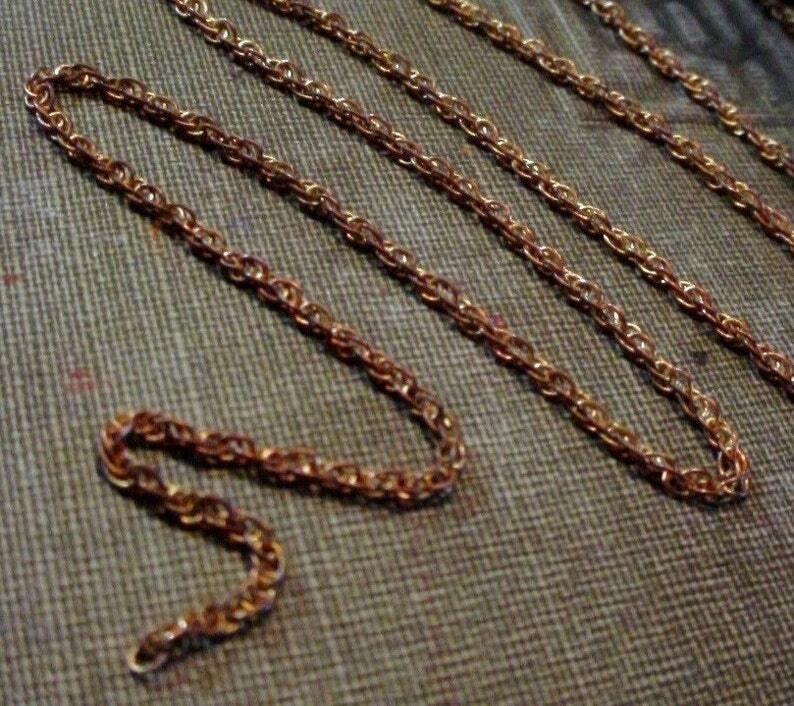 This chain has a slight reddish/tannish tone patina. However, as I get further into the spool the patina may change. Please check with me if patina color is an important factor to you. Also, if desired, you can use any standard brass cleaner or tarnish remover to restore to it's original golden tone brass color. You receive 6 feet randomly drawn from the spools shown in the photos. Genuine vintage brass. Naturally nickel and lead free. This chain is very feminine in nature. If you like the warmth of red brass you will be pleased with this chain. Thank you for your consistent product quality, safe packaging and very prompt shipping. I appreciate all the wonderful transactions. Beautiful like fine rope chain! I can't wait to use this in one of my designs. Thank you!